The vulnerability of the Internet of Things 4.0 has attracted the interest of the APT Group in the enemy country. Preface: Maybe this is a trend! If we are going to the next generation world (IoT 4.0). At the same time, the APT Group is also sniffing the cybersecurity loopholes in that place! Technical background: In business world we understand the function of broker. A similar situation in computer world, we so called gateway vs middle-ware are equivalence to broker. The modern computer world involves multi vendor and multi-environment and therefore we can’t lack of broker. As a result this area become critical. 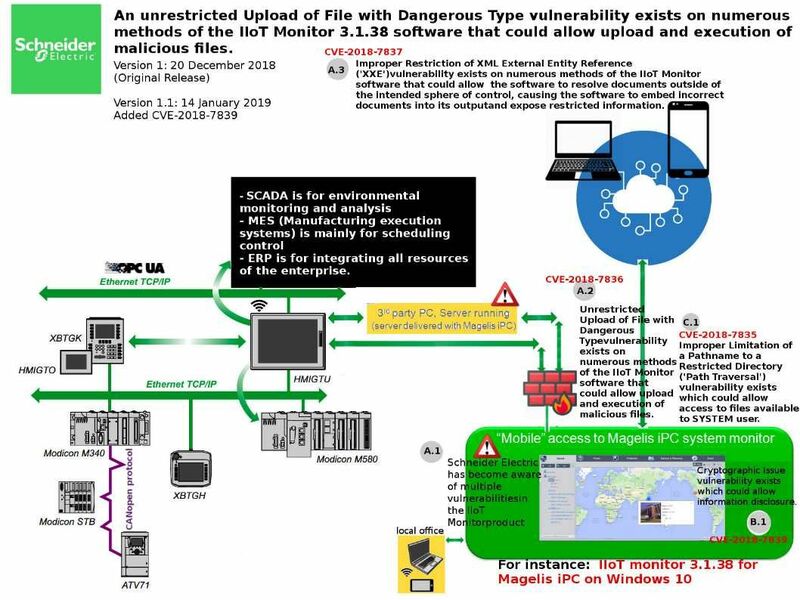 Security focus – Schneider Electric IIoT Monitor 3.1.38 vulnerabilities (see below). Remark: The key component of IIoT monitor 3.1.38 is equivalent Magelis iPC ( IIoT monitor 3.1.38 for Magelis iPC on Windows 10 ). Comment: Perhaps these vulnerabilities announce to public on Dec 2018. But I believe that more hidden vulnerabilities will be dig out in future. Stay tuned! Happy Lunar New Year. Previous PostUTM (all in one) firewall not in good shape! If you are concern cyber security, please forget so called cost effective solution.Next PostJapan government is going to conduct penetration to citizen smart home devices. Feb 2019.